Fall is nearly here and the subsiding summer heat means it's a great time of year to take your family camping and let them enjoy the great outdoors. As a teenager I would do some dumb things that I wouldn't want my kids to do, as such my expectations have changed. When I was 16 or so we would camp out in the snow with no tent. We once slept tied to the side of an overhang and took shifts while sleeping to make sure we didnt drop off the side in the middle of the night. Wow how things have changed. I've now replaced that saying "hey watch this", with "hey watch out". When I wake up after sleeping on the ground my back and knees hurt. My guess is that some of you might be in the same boat as me, but you would still like to take your family out for a good time. Here are a 7 great tips to make your family camping trip a bit more pleasant. Be sure to check the weather, most weather sites have a 10 day forecast that is fairly accurate. Pick a weekend with no rain, and mild temperate conditions. Kids don't much care for the rain, and my wife doesn't either. Nothing can ruin a camping trip like constant rain, and worse a leaky tent. What makes for a good camping trip for one person doesn't necessarily make for a good trip for someone else. Discuss sleeping expectations. Is everyone ok with sleeping on the ground? If not an air mattress might be in order. Are they expecting to sleep on pillows? Will you make smores, marshmallows, or cook in the coals? Are your family members ok with not bathing for a few days? I'm sure the kids would love that idea, but maybe your wife doesn't. Don't plan every minute. Let the kids runs and play and explore. If you plan to much you won't be able to enjoy yourself. There is no point to camping if you're going to be on your wireless devices checking Facebook every 10 minutes. You can do that at home. Make a point of turning off your devices or camp in an area with little or no signal. Camping is messy, not everyone is ok eating with dirt covered hands. I personally think it's just extra flavor but not everyone will agree. You want your kids first camping experience to be a good one. You don't need to hike 15 miles, uphill, barefoot, carrying 100 lb packs. There is nothing wrong with staying at a campground, it's still camping. 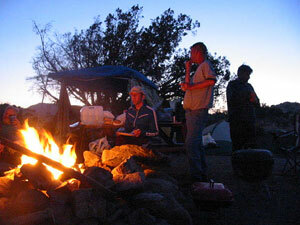 Many campgrounds have river access, ponds, and showers making the transition a bit easier. If you do hike in don't hike to far their first time. Show your family a good time, and don't stress out. You don't need us to tell you how to do that. Fire out before you sleep, tie up your food and pans to prevent scavengers, bring a first aid kit, bring matches and maybe some kindling, don't get lost, follow marked trails. Thanks to indieman for use of the photo.